Founded in the late 1970s, Abuja, the relatively new capital of Nigeria, is situated in the heart of the country in an area called the Federal Capital Territory - a location chosen for its neutrality in a country rife with ethnic and religious division. Divided into four districts, with designated business and residential sectors, the city has leafy, wide roads, high office towers, and large apartment blocks. It is infinitely less congested and polluted than Lagos, the former capital. Much of the city is still under construction and its population remains small, thus it lacks the colour and bustle of other Nigerian cities. However, it must be noted that for tourists not used to travelling on the African continent, Abuja makes for a far gentler introduction to a Nigerian holiday than Lagos does. 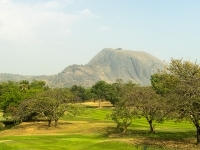 Aso Rock is the landscape's dominant feature; an ancient 400-metre high outcrop on the city's outskirts, which looms behind the attractive government buildings. Although there is little else on offer in the way of tourist attractions in Abuja, visitors can explore the nearby Zuma Rock, the National Mosque, the National Church, Parade Square, and the Wuse Market. Abuja is often used as a jumping-off point for exploring the rest of the country, and most visitors only take a day or two to take in its limited sights. Perhaps as it grows in stature and size, Abuja will become more of an interesting tourist destination in its own right.